Senior officials of the Communist Party of China (CPC) have vowed to strengthen Party-people relations over the past several days as part of a "mass line" campaign, in a bid to consolidate the CPC's ruling party status against the backdrop of a more diverse society and growing citizen awareness. 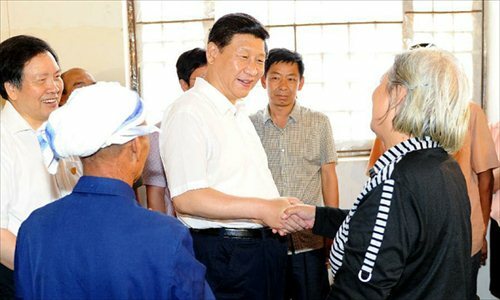 During a two-day inspection tour of North China's Hebei Province which concluded Friday, Chinese President Xi Jinping, who is also general secretary of the CPC Central Committee, urged the 85 million Party members to improve their work styles to withstand the tests the CPC faces. "We should ensure the CPC's nature is not compromised and the color of red China will never change," Xi said. During the trip, Xi visited the old revolutionary base of Xibaipo, where the CPC leadership were based from May 1948 to early 1949 when they drew the blueprints for the new country and prepared for the CPC's new role as the ruling party. Xi warned that becoming out of touch with the public was a problem, and lashed out at the harmful work styles of formalism, bureaucratism, hedonism and extravagance among officials. Zhang Xixian, a professor with the Party School of the CPC Central Committee, told the Global Times that the Party's credibility has been harmed as a result of rampant corruption, the widening wealth gap and high housing prices. In the past a few years, a number of high-level officials have been brought down by scandals and corruption, including former Chongqing Party chief Bo Xilai, former railways minister Liu Zhijun and former deputy director of the National Development and Reform Commission Liu Tienan. "If some Party members still fail to get closer to the people and don't work for their interests, the CPC's ruling party status will be threatened," Zhang said. To address the problems, Xi highlighted the importance of late leader Mao Zedong's remarks on Party members' work styles prior to the founding of the New China in 1949. In March 1949, Mao called on the whole Party to resolutely carry forward the work style of displaying modesty and prudence while guarding against conceit and impetuosity, and resolutely carry forward the style of working hard and living plain lives. An opinion piece on the website of Hong Kong-based Takungpao paper said Xi's citing of Mao's remarks was meant to use history as a mirror and build momentum for a "thorough cleanup" of undesirable work styles. Meanwhile, during an inspection tour of Zhejiang Province from Wednesday to Friday, Liu Yunshan, a member of the Standing Committee of the Political Bureau of the CPC Central Committee, said "the public's opinions serve as our mirror." Both Xi and Liu's trips were parts of a year-long "mass line" campaign that kicked off earlier this month to cement Party-people ties. The CPC has handed out the handbooks with excerpts of revolutionary forerunners and Xi's remarks on Party-people relations to Party members. Cai Zhiqiang, another professor on Party building with the Party School of the CPC Central Committee, told the Global Times that in contrast to the eras of previous leaderships, Xi is facing more diversified and complicated public needs. "The public has become more divided than ever and they have a growing awareness of citizenship," Cai said, noting they are more vocal about their rights and interests and are willing to lodge complaints with officials. "However, most of the officials have no idea about how to deal with them." Li Haiqing, a historian from the Party School of the CPC Central Committee, said in an article on the Study Times that to address official-public disputes, it is not enough to merely rectify the officials' work styles, attitudes and approach, and called on a shift of focus to system building. "Only by strengthening the building of democracy and the rule of law can the institutional environment effectively foster officials' enthusiasm and initiative in serving the people," Li said.